This is a recording of our live webinar “The World of 7notes for Android” from the 23rd of January 2012. In this presentation we show 7notes for Android and also the Amazon Kindle Fire and explain the differences between these versions. The presentation also explains how the Android version of 7notes includes a very powerful feature: the ability to utilise the handwriting recognition and prediction engine from within 7notes (the mazec window) across any application. This is achieved by installing the Mazec as an advanced input window that works alongside the operating system on the android device and allows the user to activate it for use as required. In the presentation we show how this works alongside the twitter application and also the “built-in” email application. 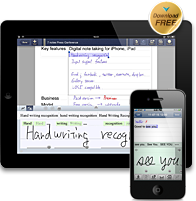 "7notes: Precise Handwriting Recognition App For The iPad And iPhone"
"7notes for iPad Lets You Take Notes On-Screen with Your Finger"
"7notes handwriting recognizer lets you take notes with one finger"
"iPad App Review - Frackulous 286"
© MetaMoji Corporation, All rights reserved.